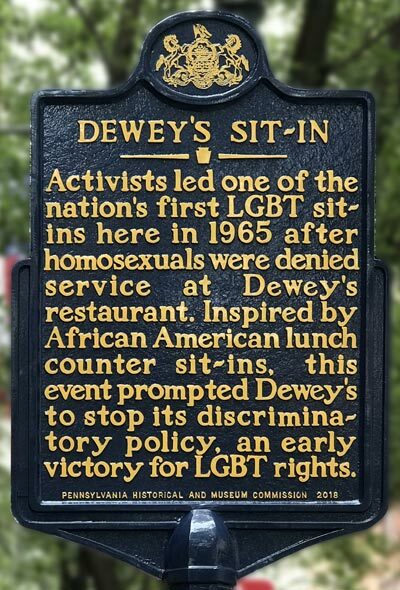 Adopting the lunch-counter sit-in strategy of the black civil rights movement, protesters held the nation's first successful LGBT sit-in in the spring of 1965 at Dewey’s restaurant. Located in the Rittenhouse Square section of Philadelphia, Dewey's was a popular hangout after the bars closed. 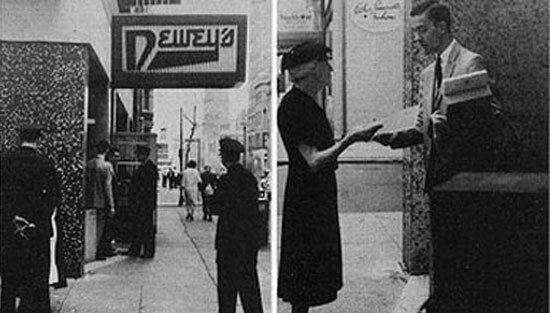 Dewey's established a policy of denying service to individuals who appeared gender nonconforming in their attire or expression and to "avowed homosexuals." With help from the Janus Society, a local LGBT organization led by activist Clark Polak, the first Dewey’s sit-in occurred on April 25, 1965. The restaurant denied service to 150 people that day. Polak, one young female and two young males were charged and convicted of disorderly conduct. The Janus Society continued to protest, distributing more than 1500 fliers in under a week and leading demonstrations by lesbian, gay, bisexual, transgender and other allied participants. A second sit-in took place at Dewey’s on May 2, 1965. Although police arrived, they made no arrests. Consequently, Dewey’s discontinued its discriminatory practices. The restaurant’s policy reversal represented one of the first victories for the emerging LGBT civil rights movement.